While learning how to precision cut, sew, and press using the Easy Precision Piecing System, students will make a 9˝x 9˝ Muskrat Paw block (see p. 86 for a photo). A great class for confident beginners and experienced quilters. • Precision piece without pins! Students will leave the class with a finished or nearly finished Muskrat Paw block. Two days (6 hours each). NOTE: This class is notion rich and a great opportunity to use as “an appointment to shop” for fabric, tools, accessories, and notions. Acorn Precision Piecing Products, Seam Align fabric glue, Easy Press Solution, Easy Press Pens, and Quilt Block Builders can be purchased from your notions distributor. The following distributors carry Acorn Precision Piecing Products: N. Jefferson Ltd., Tacony Corporation, Checker Distributors, E.E. Schenck Company, and United Notions. You can order Tear-Perfect Maker Tape and Easy Precision Piecing by Shelley Scott-Tobisch from C&T Publishing. Be Creative (Sookwang) 5mm, acid-free, double-sided tape can be purchased from N. Jefferson, Ltd.
Ironing boards with a hard, smooth surface and dry irons (no steam is used in this class). It is best if there are enough for three people to share each iron. If electricity is not an issue, place a small iron and board at the sewing stations for sewing and pressing the smaller pieces and assembling the block. Cutting station. If the space allows extra tables, it is good to have them on raisers. Tables. There should be enough space for cutting, pressing (if using a small iron and board), and sewing. NOTE: Class handouts for homework and in-class cutting have been provided with this class plan. Begin class by turning students’ machines into precision-piecing instruments. Teacher: this process can take about an hour, but it is well worth the class time. Show students how to set up their own machines so that when they leave class they are better equipped to handle little issues that may come up at home. Stress the importance of working with quality, supple thread (see p. 15). Discuss needles, making sure that each student has a new, sharp needle (see p. 16). Have the students lower the stitch length (see p. 40). Use a light-colored fabric to test stitch length and tension. Adjust as necessary until the tension is balanced (see pp. 38–40). Please make sure that each student has a good quality stitch before starting the precision-piecing process. Show how to hold the rotary cutter (p. 32). Show how to cut folded fabric in half and line up grain lines. Demonstrate cutting long strips and sub-cutting. Discuss and demonstrate how to work with directional prints. Teacher: please stress the importance of selecting only good-quality fabric. Overview and demonstrate fabric preparation (see pp. 24–27). Have students find their precise patchwork seam (see pp. 43–47). Be encouraging and begin by discussing the difference between precision and perfection (see p. 48). This is very important, as students are seeking to improve upon their technique and can get a bit nervous at this point. Make this part fun by demonstrating how to find your own precision-piecing seam. When you have completed your demo, measure for accuracy. Don’t worry if your piece isn’t exact … this happens to me from time to time … it shows that we teachers are human too! Cut strips as indicated on p. 43. Glue baste the fabrics together with SeamAlign or equivalent (see p. 43). Talk about headers and footers (pp. 40–41). Use a header and a footer. Sew the seam (see pp. 42–43). Press seams away from the center fabric. Discuss setting the seam (p. 45) and finger pressing (pp. 45 & 49). These are very important steps. This first seam can be stitched beautifully, but with improper pressing it can become distorted. Repeat the above process for the final seam. Measure for accuracy (see p. 47). Teacher: as students complete the above exercise, have your ruler at the ready! Go to each station or have the students come to you with their sample. Measure and evaluate. Congratulate the student if the center strip is exact or discuss what adjustments need to be made. For example, adjustments may need to be made to cutting, seam allowance, or pressing. Have students make the necessary changes, remove the seam(s) (p. 52), and try again until the strips measure the indicated size. Remember, be encouraging while pointing out what changes need to be made. Your students will love you for gently showing them what went wrong when you also show them how to fix it. Hand out the Quilt Block Builder and Base (pp. 7 & 8). Discuss the Quilt Block Builder. Point out what the dots and arrows are for. Explain why it is printed in gray scale. Show how to put pieces in position on top of the stabilizer as they are cut. Demonstrate cutting and sub-cutting. Have everyone start cutting for the pinwheel. After this, students will work at their own pace. Once all students have cut the pieces for the pinwheel, continue with the class. The rest of the cutting can be done at home if class time runs out. Discuss working with directional prints (p. 70). Draw a diagonal line (p. 63). SeamAlign along bias (p. 64). Sew the half-square triangles (p. 64). 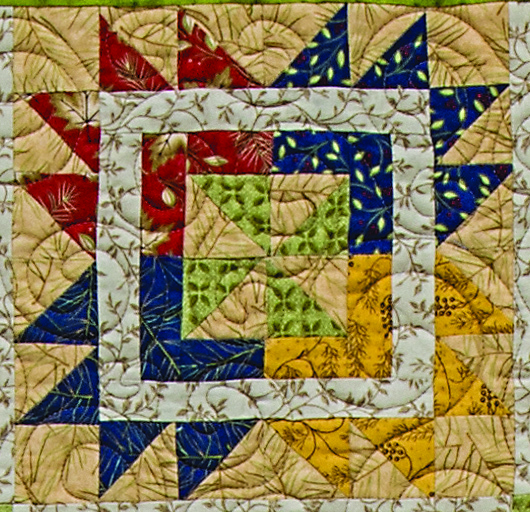 Show how to chain piece half-square triangles (p. 65). Cut on the line (p. 64). Place pieces in position on the Quilt Block Builder. Following the pressing arrows (some half-square triangles are pressed to the dark and some to the light), press the half-square triangles (p. 65). This is where Class One comes to an end. Encourage students to continue pressing their half-square triangles and finish cutting the pieces for the rest of block at home. The half-square triangles will be trimmed in Class Two. 1. Trim the half-square triangles (pp. 66–67). Place in position on the Quilt Block Builder. 2. Show students how to enhance precision by adding Tear-Perfect Maker Tape to their square rulers (p. 65). For instructions on using double-sided tape, see p. 65. 3. Make the pinwheel (pp. 67–69). Show students how to nest seams (pp. 55 & 68). Employ the same steps used when making the test strips for pressing. Work with the Quilt Block Builder for directions to press seams. Point out the pressing arrows. 4. Begin assembling the rest of the block (p. 88). When sewing the half-square triangle units together, demonstrate chain piecing (p. 51). 5. Teacher: congratulate yourself on a job well done! Take pictures of your students’ blocks and brag!